Overview: The National Science Foundation's VLBA is a system of ten identical radio-telescope antennas controlled from a common headquarters and working together as a single instrument. The radio signals received by each individual antenna contribute part of the information used to produce images of celestial objects with hundreds of times more detail than Hubble Space Telescope images. Stars: With the VLBA, astronomers have tracked gas motions in the atmosphere of a star other than the Sun for the first time; made the first maps of the magnetic field of a star other than the Sun; and studied the violent dances of double-star pairs in which one of the pair is a superdense neutron star or a black hole. Protostars, star formation, and protoplanetary disks: The VLBA has provided scientists with some of the best views yet of very young stars and the complex regions in which they are born. VLBA images have shown outflows of gas from young stars and disks of material orbiting these new stars -- material that later may form planetary systems. Supernovae and Supernova Remnants: The VLBA has directly measured the expansion of a shell of exploded debris from the supernova SN 1993J, in the galaxy M81, some 11 million light-years from Earth. This has allowed scientists to learn new details about the explosion itself and its surroundings as well as calculate the distance to the supernova by using the VLBA data in conjunction with information from optical telescopes. VLBA images have shown regions of shocked gas in supernova remnants. The Milky Way: Radio waves from extragalactic objects, such as quasars, are affected by variations in the interstellar medium of the Milky Way. By measuring these effects with the VLBA, scientists are gaining valuable information about this tenuous component of our own Galaxy. Similar studies can tell about the distribution of hydrogen gas in our Galaxy. The great resolving power of the VLBA will allow astronomers to directly measure the distance to the Milky Way's center, some 30,000 light-years away, and has detected the tiny apparent shift in its position caused by our Solar System's motion around that center. The Solar System takes more than 200 million years to complete an orbit of the Galaxy's center, but the VLBA can detect that motion in less than a month! Other Galaxies and Active Galactic Nuclei: The sharp radio "vision" of the VLBA has allowed scientists to study other galaxies in unprecedented detail. Numerous VLBA studies have focused on active galactic nuclei -- the "monsters" at the hearts of many galaxies thought to harbor supermassive black holes at their cores. The black hole is thought to be surrounded by a rotating disk of material being sucked into it, and jets of subatomic particles accelerated to nearly the speed of light by the gravitational energy of the black hole. VLBA studies have given strong support to this "standard model" of an active galactic nucleus, showing the accretion disk in several such systems, and even measuring motions in one such disk. VLBA observations also have provided strong evidence that the material in the jets may be a mixture of matter and antimatter. Cosmology: The VLBA's resolving power has allowed the farthest direct distance measurements yet made, of galaxies up to 23 million light- years away. Farther still, the VLBA is being used to study gravitational lenses in attempts to use such lens systems to accurately measure extremely great distances, and thus to refine estimates of the size and age of the universe. VLBA observations also are being used to detect possible structure in extremely distant objects, to learn about the nature of the universe when it was but a fraction of its current age. Operations: The VLBA is operated from the National Radio Astronomy Observatory's (NRAO) Array Operations Center (AOC) in Socorro, New Mexico. The staff of the AOC also supports the Very Large Array, a system of 27 antennas 50 miles west of Socorro. The NRAO is a facility of the National Science Foundation, and its instruments, including the VLBA, are available to the scientific community on a peer-reviewed basis. Scientists whose observing proposals are successful can obtain extensive assistance from NRAO astronomers and technical staff in preparing for their observations and in processing their data after the observations. Through this process, numerous graduate students now are using the VLBA for their dissertation research. History: Construction of the VLBA began in 1986, and the last observing station was completed in 1993. Astronomical observations with the partially-completed system began in 1987. 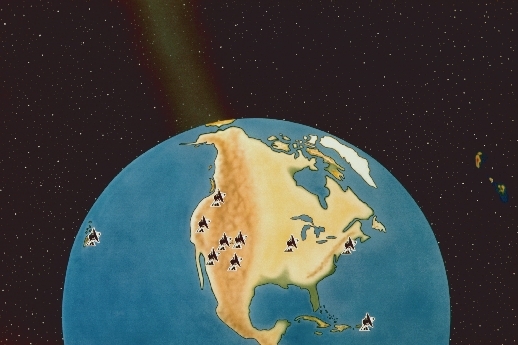 All 10 VLBA stations were used for observing the first time in May of 1993. The official opening of the VLBA was held in Socorro, NM, on August 20, 1993. The total cost of constructing the VLBA was $85 million. Stations: The VLBA has stations at: St. Croix, U.S. Virgin Islands; Hancock, New Hampshire; North Liberty, Iowa; Fort Davis, Texas; Los Alamos, New Mexico; Pie Town, New Mexico; Kitt Peak, Arizona; Owens Valley, California; Brewster, Washington; and Mauna Kea, Hawaii. Technical Data: The VLBA's 240-ton dish antennas are 25 meters (82 feet) in diameter. They are equipped with receivers capable of detecting signals at frequencies ranging from 300 MegaHertz to 86 GigaHertz in non-continuous bands. During observations, data is collected at each station and recorded on magnetic tape. Each 18,000-foot reel of this tape holds 750 GBytes of data. Following observation, the tapes are shipped to Socorro. In Socorro, the VLBA Correlator, a special-purpose digital machine that combines the signals from all antennas, can perform 750 billion mathematical operations per second. The VLBA can produce images with a resolution of less than a thousandth of a second of arc. Such resolution is the equivalent of being able to stand in New York and read a newspaper in Los Angeles. The VLBA routinely works with other radio telescopes elsewhere in the world and in space.